For most of you, that probably doesn't sound too exciting but for those of us who are registered dietitians, it is a big deal. This year's theme, as sponsored by the American Dietetic Association, is "eat right.with color" (the ADA website is eatright.org. so its a cute play on their logo). The message is to encourage adding a splash of colors to your plate thus ensuring you are consuming the various nutrients and antioxidants found in fruits and vegetables. Each color has a different bundle of potential benefits based on the antioxidants which are found in the pigments. While I could go into the details, lets just say that the deeper the color, the better it is for you. One of the easiest colors to add to your diet is green. Green vegetables are high in Vitamin A,C,E,K, folate and niacin. In other words, eat your veggies!! I thought I'd share a few of my standard green vegetable dishes to give you inspiration and motivate you to think green. Believe it or not, I love brussel spouts. I know, its weird. I'm not sure when it started, as I doubt I asked for them as a kid, but I cook with them all the time. One of my favorite ways to make them is as a warm brussel sprout salad. I owe the inspiration to Pizza Antica, but have simplified the recipe and made it as easy as possible. First, I cut the top (or bottom) of the brussel sprout off to release the leaves. I pulled off the leaves to add volume and so that they cook faster. A bit of diced onion and some of olive oil is all you need to add flavor and get them cooking. And now for the secret ingredient. Croutons! I'm not sure if you've ever had warm croutons, but they are a completely different experience from the hard ones found in most salads. When they heat up, they soften and provide a great texture contrast. Right before the dish is finished cooking, I add a little balsamic vinegar and the croutons are a great help at soaking up the flavors. Topped with Parmesan cheese, it is the perfect starter or side dish to any meal. 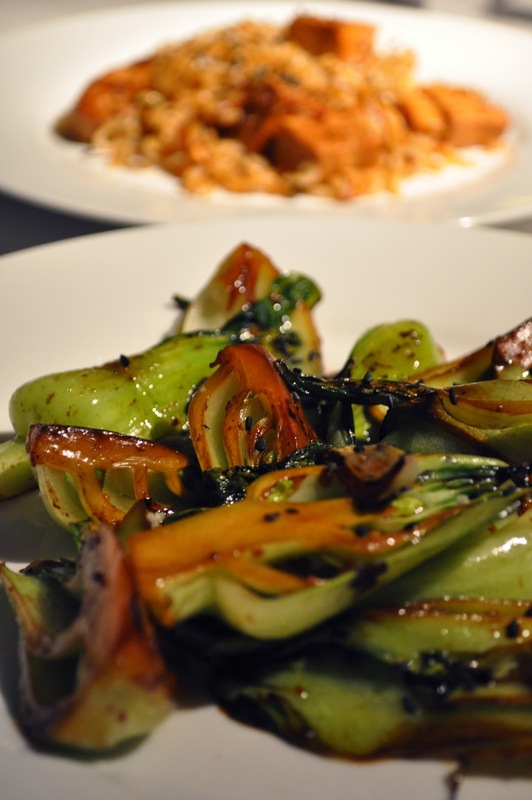 Baby bok choy, also known as Chinese Cabbage, is a popular leafy vegetable in Chinese cuisine. It seems to me to be a cross between celery and spinach, although it isn't related to either. It is actually the same species as the turnip, but I admit that I don't see a connection. However it is classified, in my books, its delicious. The flavor is very light but slightly sweet, and the texture is wonderfully crisp yet wet. I find them visually beautiful, and in these photos they remind me of some exotic sea creature, adrift in the ocean. Poetic descriptions aside, they are easy and quick to cook. I threw them in a very hot pan with vegetable oil, soy sauce and a touch of sesame oil. Since it has such a strong and distinct flavor, its easy to overdo it on the sesame oil so I suggest you start small and build up as needed. The last green recipe I want to showcase is a pasta dish with broccoli and spinach. I always try to keep spinach in the fridge because it is so easy to add to dishes, and get in those extra vitamins. It wilts down quite a bit so you can concentrate your nutrients without a lot of bulk. I also love broccoli. I can eat it steamed with nothing on it, not because I'm trying to be good, but because I really enjoy the natural flavor. For this recipe, I simply cooked the spinach and broccoli in olive oil and garlic. I added some store-bought pasta purses. This one was stuffed with brie and roasted garlic. After adding my usual shaved parmesan and freshly cracked pepper, this dish is ready to enjoy. So next time you are at the grocery store, or farmer's market, or even at your favorite restaurant, think about eating right with color. As Georgia O'Keefe said, "I found I could say things with color and shapes that I couldn't say any other way- things I had no words for". I think its kind of the same thing when cooking with vegetables. Don't you? I especially love the first photo. It could be the cover of a book. CAL, these look like they are all from a restaurant! I'm definitely gonna try making this brussel sprout salad. Great post! You make me want to head straight to the kitchen and whip on my apron. Don't ever stop doing this. I don't know where I would find a finer and healther diet. Those brussel sprouts really pack a lot of healthy=) They look delicious too.